This is a great recipe to have in your repertoire! 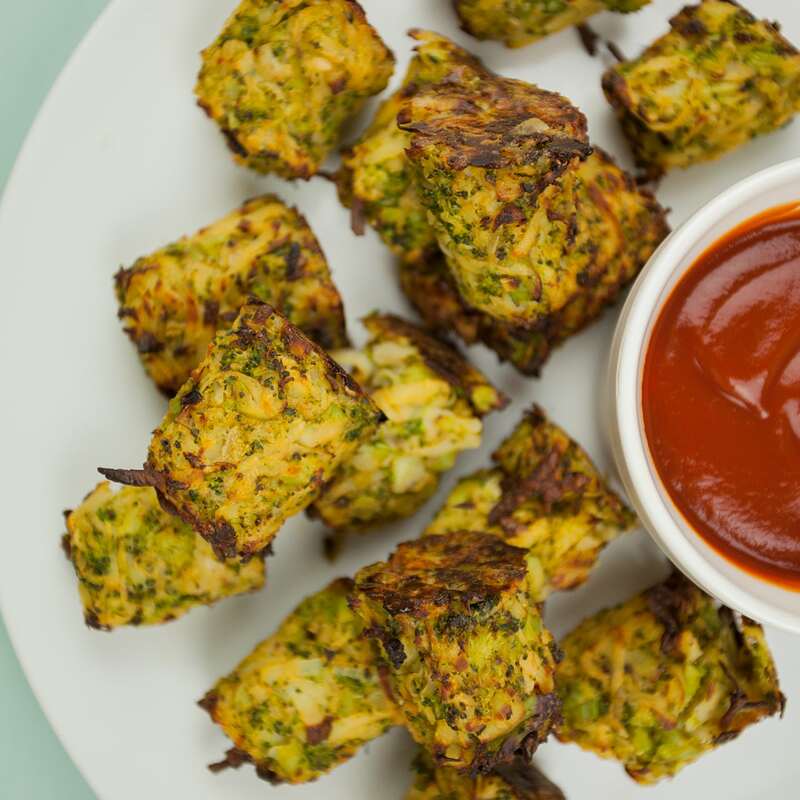 The tots are simple, hearty and filling – we usually make them when friends are coming over, and leave them on the table for people to pick at before the main course. The chili powder gives the tots a gentle kick, but you can avoid chili and go for something more subtle like paprika if you’re not a big fan of spicy food. Preheat oven to 220°C and line a baking tray with greaseproof paper. Then fill a saucepan with boiling water and place on a medium heat. Peel the potato and roughly chop it into 2 inch chunks. Add the potato to the boiling water and boil for 5 minutes. Meanwhile, trim and discard the broccoli stem (save the stem for a soup) and separate the head into medium-sized florets. Place the broccoli florets in the saucepan with the potato and boil for a further 2 minutes. Drain the water from the pan and leave the potato and broccoli to cool. Once cool, grate the potato and finely chop the broccoli, then transfer both to a mixing bowl. Add the remaining ingredients to the mixing bowl and mix well with your hands until thoroughly combined. Take a large tbsp of the mixture, squeeze it in your hands to form a ball, then shape it into a cylinder. Repeat and place each broccoli tater tot on the lined baking tray. Bake in pre-heated oven for 20 minutes. Leave to cool for 10 minutes before serving with ketchup. We’re working on it! Sorry for the inconvenience! Yum! I love this combination. This will be snack this afternoon. 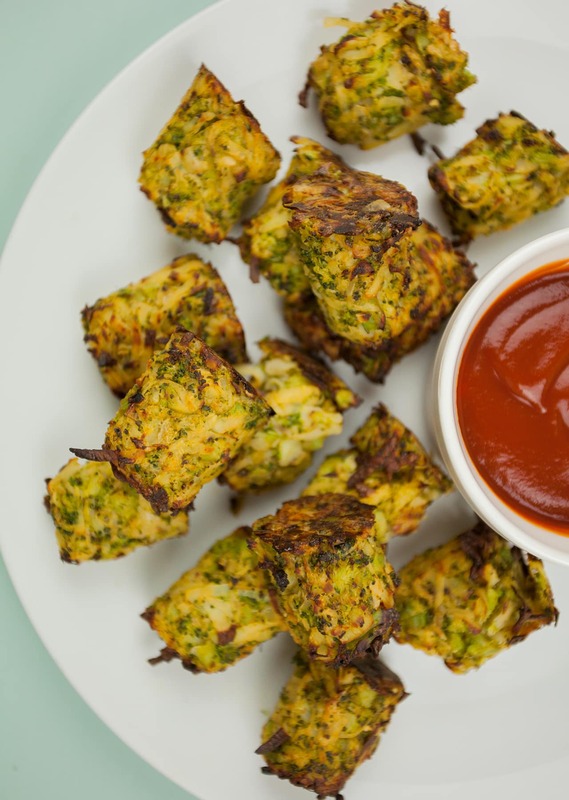 We haven’t tried freezing these tots but do let us know if you give it a go! After 20 minutes at 220, these were still basically the same texture as when they went in and not browned at all. After cranking up to 335 and giving them another 10 minutes, they look much better! Hey Jamie. Are you cooking at 220 C or 220 F? Our recipe is in celsius! Hope that helps. I will definitely be trying these, reminds me of when my sister-in-law made us broccoli burgers YUMMY!! Would you do a translated version using F temp and what g is? Is it one cup of potatoes, 1 med potatoe? Can you just put it all in a food processor and pulse to save time dealing with the two separately? Just wondering before I try this. It actually sounds good for grownup snacks. These came out delicious and my family loved them! I like how you steamed the potato and broccoli first. It made grating so much easier. I did make a few changes. I added some grated carrot and flax meal soaked in water. It added a nice crispness to it. I seasoned with powdered onion, garlic, mustard seed, and smoked paprika. If I’d had time I would have put it in the freezer for a short time to make it easier to mold into a tater tot shape. It was a little too sticky. Thanks for posting your recipe! Your oven is going to be preheating for a very long time!